MGB Food: I need to eat yogurt every day and thankfully I like yogurt so that is very good. I decided to do some yogurt reviews. 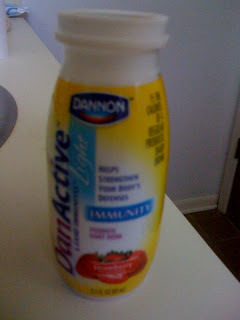 This review is on Dannon's DanActive. This yogurt is not thick as average smoothie type drinkable yogurts but I like it because it is more like a drink than a smoothie. The flavors are all tasty and I like the pomegranate the best. The only thing I wish it had was a reclosable top. It has a peel back foil that, once removed, you can't close it and finish later. To a normal person this would not be a big deal as it is just about one gulp anyhow.. but I don't gulp anymore.